Minnesota became a state in 1858 and participated in its first presidential election in 1860. Minnesota voted for the Republican Abraham Lincoln in 1860 and began a string of 13 consecutive elections where Minnesota voted for the Republican nominee. Meanwhile, Morrison County voted for the Democratic nominee in its first nine presidential elections. The county voted against Abraham Lincoln and was one of only three Minnesota counties to pass over Honest Abe twice. Stearns and Brown counties also joined Morrison in voting for Democrats Stephan A. Douglas in 1860 and General George McClellan in 1864. The voting history of Morrison County may surprise some readers. Morrison County has been reliably Republican for the last five presidential elections, including the recent 2016 election. But there are long streaks where Morrison County was reliably Democratic: Nine straight elections between 1860 and 1892, and, six straight elections from 1960 through 1980, even voting for Democrat George McGovern in 1972, while Republican President Nixon carried Minnesota and 49 other states in a massive landslide. 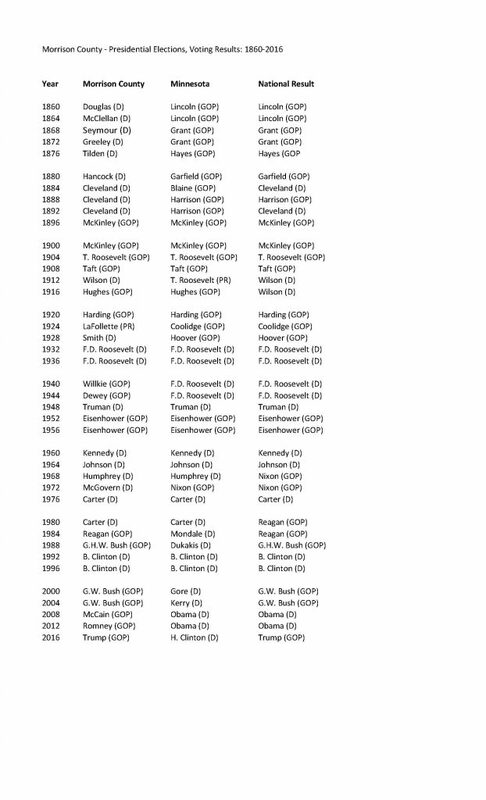 In contrast, 1972 was the most recent time the State of Minnesota voted for a GOP Presidential candidate. Morrison County has voted with the rest of the state 18 of 40 times. Morrison County has sided with the nationally victorious candidate on 23 occasions. Minnesota has voted with the winning candidate 29 times. Of the 18 times Morrison County and Minnesota agreed on their selection of presidential candidate, 15 times that candidate was victorious in the national election. Morrison County voted Democrat in its first nine national elections and thereby voted with the losing candidate in six consecutive elections during a time of GOP dominance in the presidency. The State of Minnesota voted Republican in every presidential election from 1860 through 1880: Lincoln twice, Grant twice, Hayes and Garfield. While Franklin D. Roosevelt carried the State of Minnesota four times, Morrison County only supported him in his first two runs, 1932 and 1936, preferring Republicans Wendell Willkie in 1940 and Thomas E. Dewey in 1944. Morrison County has reflected the national result six times in a row on two separate occasions: 1892 – 1912 (Cleveland, McKinley twice, Teddy Roosevelt, Taft, Wilson) and 1984 – 2004 (Reagan, George H.W. Bush, Bill Clinton twice, George W. Bush twice). Morrison County also asserted its independence in two notable elections. In 1912, most of Minnesota voted for Teddy Roosevelt, the third-party candidate running under the Progressive Party (a.k.a. “Bull Moose Party”), which he created after the Republican party failed to nominate him. Morrison County voted for Democrat Woodrow Wilson instead. In 1924, most of the state and most of the nation voted for Calvin Coolidge, but Morrison County posted its only victory by a third-party presidential candidate, Wisconsin Senator Robert LaFollette of the Progressive Party. This article was first published in the Morrison County Historical Society newsletter, Volume 29, Number 4, 2016.